This is what has been running through my head on the morning of 19th of May 2006 when my game has arrived. 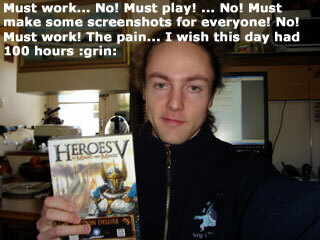 It is now past midnight and I still have not installed or played Heroes 5. But this suffering has been for a good cause. Below you will find optimized scans and photographs of all the artifacts that Heroes of Might and Magic 5 Deluxe Edition has to offer: the nice box, the map of Ashan, the faction document and the art book. Sfidanza has also sacrificed his playing time to update the game data pages, so there's be plenty of info for you to enjoy. The Heroes 2 CD in this deluxe package reminded me how 10 years ago I've made a web page about Heroes of Might and Magic 2 and was proud of getting 12 visitors one day, and how over the years it grew into Age of Heroes visited by 8,000 people per day and Heroes Community with quarter of a million posts. So I'd like to thank the heroes who made this all possible in the first place: Ubisoft, the producer who did a fine job resurrecting the HOMM series and granted us many fun times yet to come!